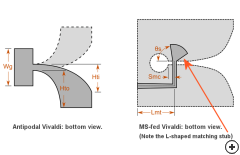 Microstrip-fed Vivaldi and Antipodal Vivaldi designs in Antenna Magus (it should be mentioned - as this is not apparent from the design sketches - that the physical size of the Antipodal Vivaldi is almost half the size of the standard MS-fed Vivaldi when designed to meet the same performance objectives). 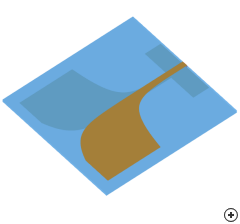 Design sketch comparing the antenna and feed structures of the Antipodal vs MS-fed Vivaldi antennas. Typical total gain patterns at fmin, 2.5fmin and 4fmin.